What to give as souvenirs from Japan? One might recommend 100-yen store (105 yen with tax), in which you can get plenty of stuff for 100 yen. Omamori--charms (not the official ones issued by temples, though), souvenirs, hats. Woks, books, hair pins. Or perhaps gashapon would be an ideal choice? Some interesting items wrapped in capsule-like plastic. Sometimes toys, pins, watches. Sometimes cell phone charms or even, handkerchief. I think Kit Kat is an ideal choice! Why, you might ask? Don't they sell Kit Kat anywhere? True, but Japan has oh-so-many-flavors. They are unique and suitable as souvenirs. 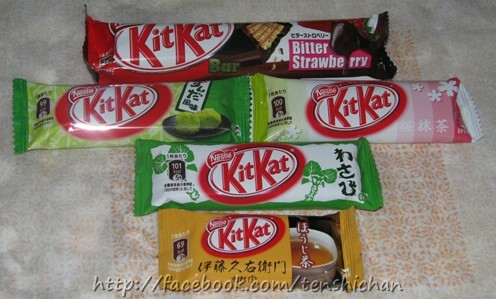 Japan has many variants of Kit Kat, depending on the season and the cities. Sadly, some of them are limited editions. Some can only be bought at certain cities. But you can find at least two or three variants in an airport, perfect grab, if you're in a hurry. IIRC, one box of Kit Kat (two packages inside) costs about 120 yen. Here you can see some variants that I found. Bitter strawberry, yes, they use dark chocolate so it's bitter, with a hint of strawberry. Zunda mochi. It's sweet, but that's it. Sakura matcha... this one is my favorite! Sweet with the fragrant smell of sakura, with a tang of green tea. Wasabi. Weird, but no, it's not like the real wasabi. A bit sweet and sharp, that's all. Roasted tea, also my favorite. Roasted tea is actually the regular tea. Kit Kat is a symbol of success and good luck, especially for students. Japanese Postal Office also offer Kit Kat postcards. Yes, they also send those to other countries!